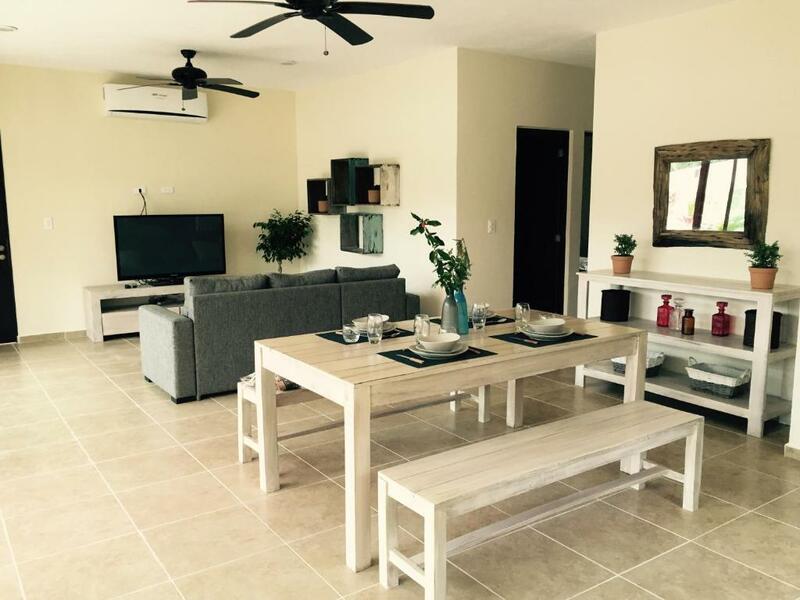 Big affordable new apartment within a 15 minute drive to the best beach in Mexico. very nice location close the beach and the village where we find cool restaurants bars and local shops, the host ever present give us advices to find everything. cery recommwndable! Beautiful courtyard, nice house and spacious rooms. The comfort, tranquility, and the privacy of the place...I will recommend to buy groceries and snacks!!! Very nice pool and balcony. Good communication with an owner. Clean apartment with a very helpful caretaker who made hinself available when needed. Pool was great to cool off after a day of sightseeing! Kitchen was well equipped and air conditioner very effective. All taxi drivers knew the building by name so we always got back in good time! 50 pesos to most places around town and you can hire bikes for 100 pesos per day from the caretaker. Quiet and pretty surroundings with lots of bird life. lugares a visitar muy cerca,un lugar muy tranquilo y las personas que estan al pendiente muy amables. 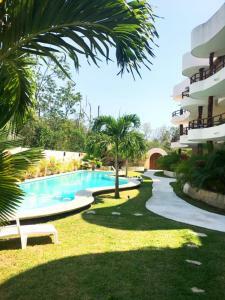 Jungle Flat Tulum This rating is a reflection of how the property compares to the industry standard when it comes to price, facilities and services available. It's based on a self-evaluation by the property. Use this rating to help choose your stay! 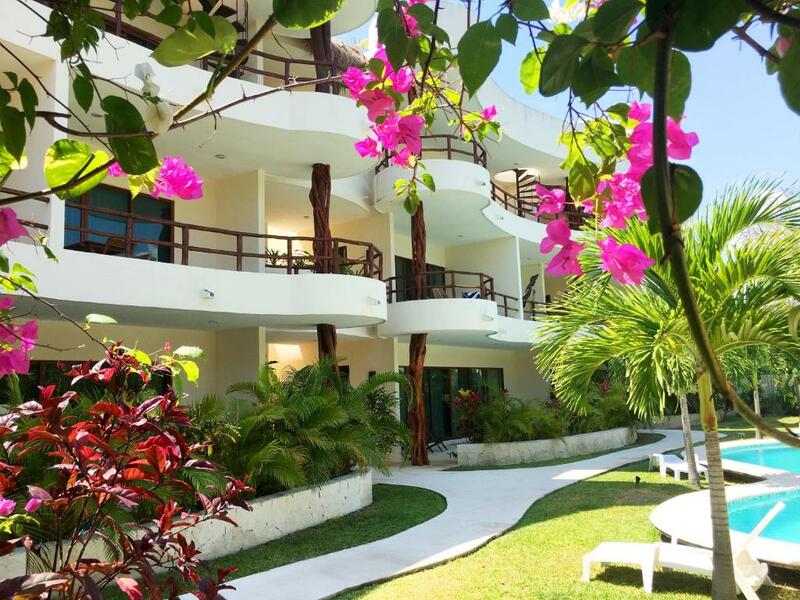 Featuring free WiFi and a terrace, Jungle Flat Tulum is located in Tulum. Akumal is 17 miles away. Free private parking is available on site. 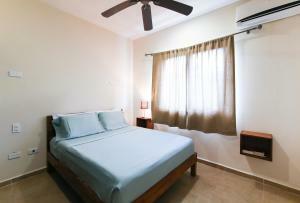 Featuring a terrace, all units are air conditioned and feature a dining area and a sitting area with a flat-screen TV. There is also a kitchen, fitted with a microwave, toaster and refrigerator. 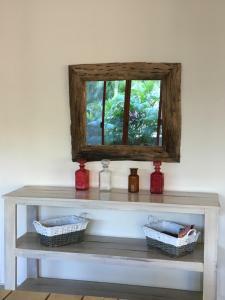 Each unit features a private bathroom with free toiletries. Bed linen are featured. Punta Allen is 28 miles from Jungle Flat Tulum. 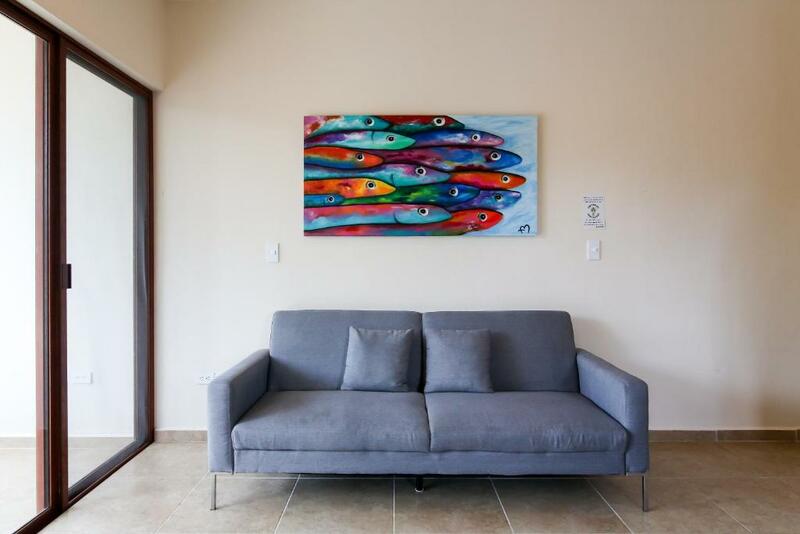 Cozumel Airport is 41 miles from the property. When would you like to stay at Jungle Flat Tulum? 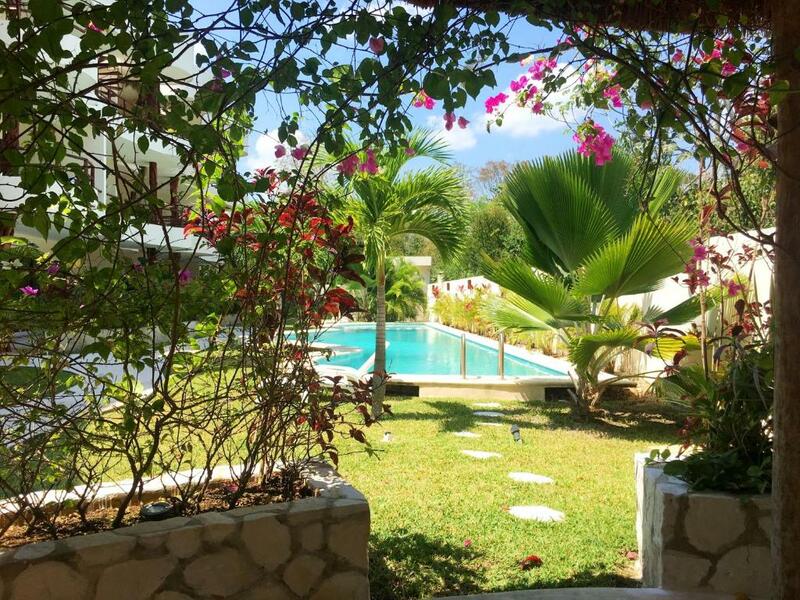 Our accommodations are oasis of peace surrounded by the beautiful Caribbean jungle. I love to travel and know the most fascinating cities in the world. Tulum’s spectacular coastline – with all its confectioner-sugar sands, jade-green water and balmy breezes – makes it one of the top beaches in the world. Recently has been named “the hottest section in Mexico” by the Wall Street Journal and “the fastest growing town in Latin America” by USA Today. House Rules Jungle Flat Tulum takes special requests – add in the next step! Jungle Flat Tulum accepts these cards and reserves the right to temporarily hold an amount prior to arrival. Please inform Jungle Flat Tulum of your expected arrival time in advance. You can use the Special Requests box when booking, or contact the property directly using the contact details in your confirmation. The noise of the fridge, the uncomfortable couch, the construction around all day, the dirty shower, the uncomfortable chairs on our balcony. Loud Construction every morning starting at 8 am, 6 days a week. Could have provided a change of sheets as it was a 8 night stay. On the pictures looks very nice, but reality is not so well. The showers was clogged, dust everywhere, bad attitude, there were no batteries on the TVs remote control, door lock broken etc. Very hard to find, but finally managed to cope. The accommodation is under a different name in the place (Selva Madre) and is elsewhere (20.1990, -87.4764), so it is very bad to looking for. It is located in the under-construction zone, so on a very poor road, but quiet. One bathroom's shower was not working well and there were two occasions when there was no water at all - the caretaker was able to fix this though. Was a fair distance from town, 20 minute walk or could walk to nearest main road to flag a cab. 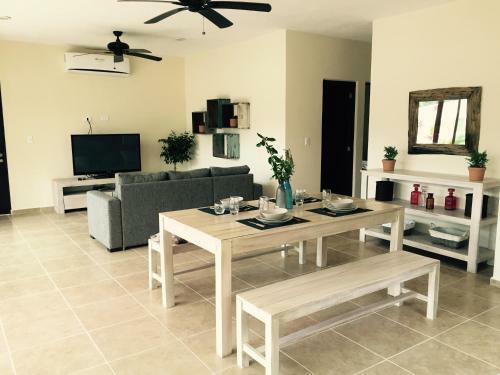 We stayed in one of this new and modern apartments, in the center of the Pueblo of Tulum. It's a great place to stay considering that in a minute you're on the main street (with shops, supermarkets, restaurants) that drives you to the various sites to visit around Tulum, and in five on the seaside when you want to spend a day relaxing on the magnificent white beach. The apartment is clean, spacious, modern and fully equipped with various amenities including air conditioning, not to be underestimated considering the heat and how difficult it is to find it even in the most star hotels. The “pearl” of the house is this spacious terrace with table, chairs and hammock overlooking the garden and the condominium pool. 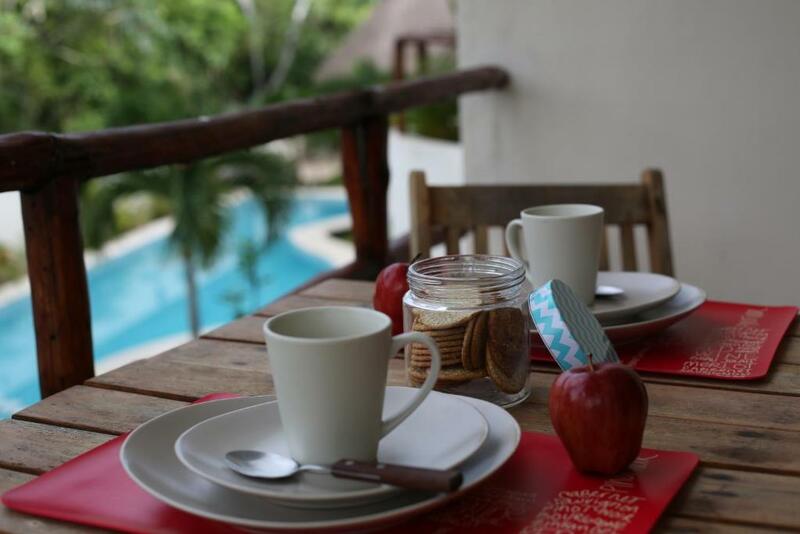 The best time was in fact the breakfast.. prepared at home, as the kitchen is fully equipped (stove, toaster, coffee machine, cups, plates) .. eaten on the terrace in the tranquillity of the place ... and ended with a dip in the pool that gives you the right charge to start the day. I would definitely recommend !!! 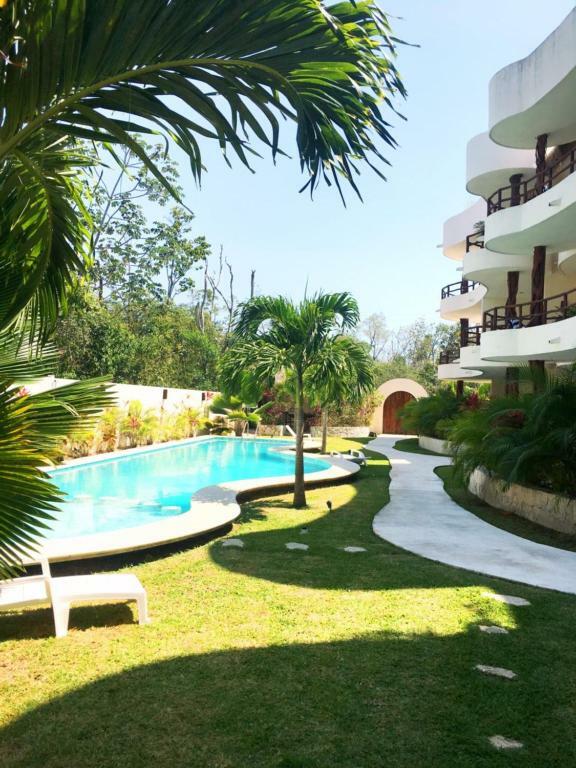 The hotel I booked was jungle flat Tulum however I could not find it and enquired at Luna Llena where it was - they said the reservation I had was with them? Luna Llena could be a nice hotel however it is in the middle of no where and next to a building site so very dusty. They provide bikes which is needed to get around - the main road is about 15 minute bike ride away, the beach 45-1hour bike ride away. The breakfast provided was basic but nice, toast, cereal etc. The staff were friendly although some only spoke Spanish which did make communicating difficult particularly when the receptionist did not understand English and the confusion over the hotel I had booked. I reserved my booking with visa so assumed I could pay by card as there was a card machine but I was told the following morning I had to pay with cash. I was messaged by a lady called Isabella many times regarding this (assume she is the owner) and she sent a friend at 10pm that night to collect the payment as the reception was closed. I felt quite uneasy about this and used the security guard as a witness for me paying for my stay. I have never experienced this before and felt the hotel was quite unorganised and as a lone female guest felt quite vulnerable. The air conditioning was working in the morning when I left for the day however on my return to the room in the evening it was very hot. As the reception was closed, I asked the security guard if he could assist which he did his upmost to do however he concluded it was broken and he would report it to reception in the morning - this made for a very stifling and uncomfortable night with not much sleep due to the room being hotter on the inside than the outside! There is a lot of building work in the area so I assume once the new hotels have been developed the area has potential to be a nice cheap option for those with a car that want to experience Tulum. (Room) *Mold at the wall inside the Bedroom * Urine sediments in the toilet *bad smell inside the rooms *putrid smell of the water (from the tap) *dirty socks laying on roof terrace and cigarrete butts *in the room layed a full garbage bag (Arrival) We couldnt find the place cause the description in the inet was wrong. We met another tourist couple with a taxi who couldnt find it, too.The adress was a dead end road leading in the jungle.There also were no sign with the name of the hotel, nowhere. The worst thing when we finally found the place after one hour and several phone calls *there was no room for us in the hotel we booked, so their offered us a dirty messy apartment that looked and smelt like a sinkhole.Since we already booked it and couldnt find anything else that quick over the weekend, they offered us a 50 dollar discount and promised we only had to stay in this hole for one night and then could change into the originally booked room. Which they only did offer after 2 hours of arguing with them, because we wanted to have the room we booked on booking. They blamed booking.com and that this happens all the time even when they are fully booked, which was a lie. Because we met 2 guests from Germany that day, who had booked a room in the morning on the very same day but for 5 nights and they got the room they boked. We had booked 5 days before that but only for 3 nights and this was a mistake of booking.com? So they tried to move us to some apartment nearby and even tried to sell us this messy place as a 5 Star Hotel that would be better than the original room we booked.There the aircondition didnt work. It wasnt cleaned until 6:00pm and even then it was still dirty.The toilet flush didnt work so we had to use the trashbin as a water bucket. Also the toilet was leaking, so additional bad smell came out of the washing room. Before I witnessed this room, I didnt know that a toilet could actually grow stalactites and stalacmites out of urine. There were few items that were broken (shower faucets and lock of bathroom door 🚪got stock a few times). The apartment is very basic, towels and bed linen were old. The location is not good. It is a new neighbourhood, which is just developing. Lots of construction in the area going on. Only suitable, if you have car or ready to go everywhere by taxi. Cab drivers higher the price, when know, where you going as there is no proper road to the place. No proper shops or supermarkets in walking distance.